Doubtlessly, the best 3d deer target lets you learn how to accurately hit the vital organs of your target deer with each arrow you fire. But choosing the best one for your needs is a daunting process given the many varieties out there today. Luckily, I’ve picked the four best targets to help improve your shooting and accuracy needs below. What Is The Best 3D Deer Target On The Market? 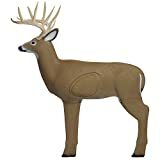 What Are 3D Deer Targets? Why Should You Use a 3D Deer Target? 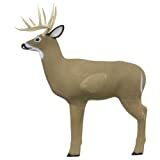 Can you Use Your 3d Deer Target as a Deer Decoy? 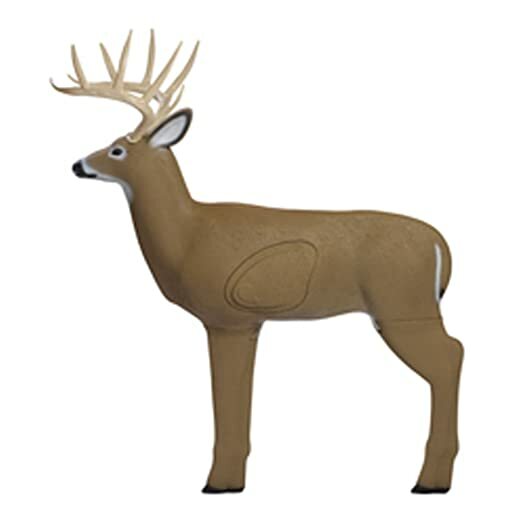 If you’re looking for the best-quality 3d deer target with a fair pricing, you cannot go wrong with this lifelike Shooter Buck 3D Archery Target. One particular feature I love about it is that it employs Polyfusion Technology to ensure overall uniform appearance while ensuring easy removal of arrows. I also appreciate the fact that it comes with a replaceable core insert which goes a long way in extending its service life. It’s worth noting that each core has unparalleled strength- allowing it to take up to 1000 shots before you can replace it. 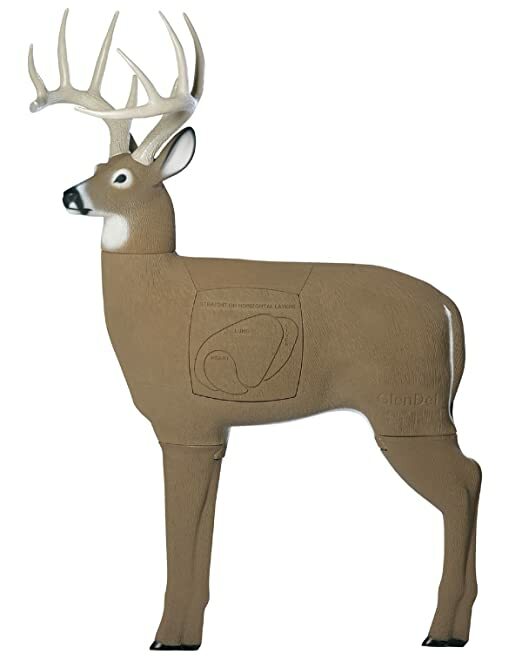 If you don’t like the non-weatherproof issue in the above product, you might consider looking into the Big Shooter Buck 3D Archery Target, which also comes with a lifelike buck design to give you the real-life shooting experience. It comes with 100% weatherproof construction, allowing it to endure different weather conditions without compromising its quality. I couldn’t help noticing that this particular target comes with a slightly larger replaceable insert that what you’ll find in the other models, making the replacement process much easier. I also trust that you’ll love the better stability offered by this target, thanks to the ground stakes that come included in the box. Its detachable legs make it hassle-free to store. 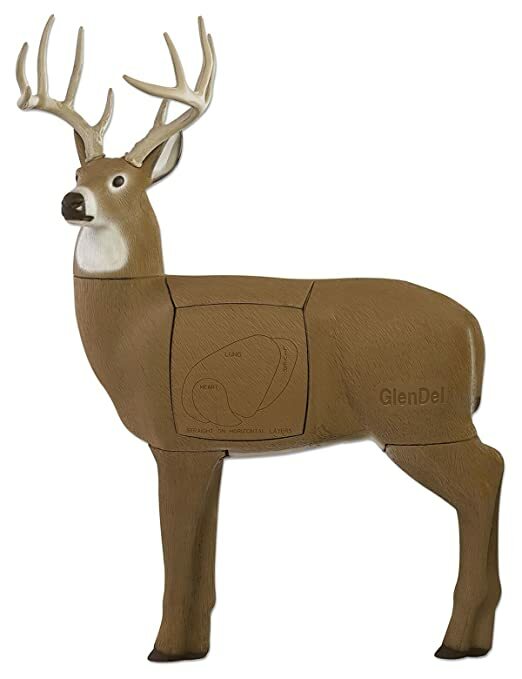 If you’re experiencing hard economic times right now but still want to secure a great 3d target to enhance your shooting skills, you’d want to consider the GlenDel Buck 3D Archery Target. Despite its low pricing, this target manages to offer you some premium features associated with the high-end models. It looks just like a real-life buck which adequately prepares you for real-life hunting situations. Like the above two models, it also features a replaceable, high-density insert which results to extended lifespan. Because it comes with ground stakes, it gives you a stable performance in the sense that it does not waiver under all the shots you throw at it. Personally, I love the toughness this target comes with, enabling it to withstand different types of arrows, including the field tip and broadheads. If you the best archery target for honing your aiming and accuracy and you’re ready to meet its price, say hi to the GlenDel Full-Rut Buck 3D Archery Target. Unlike all the models I’ve previously reviewed, this top-rated deer target offers you multiple shooting and practicing areas, while allowing you to replace them when they get worn out. This makes it the ideal practice target for beginner bowhunters who are prone to missing the vital sections. It’s my all-time favorite archery target since it comes with the actual size and weight of the real buck you chase in the woods, unlike the other models, turning your practice sessions into a reality. Not only that, I love how easy it is to set up and take down this target, plus its replaceable target which increases its lifespan. As most of you are used to the box targets for archery practice, 3d targets might sound like an utterly strange term. A 3d deer target refers to a target that looks exactly like the real deer, with all the body parts included for 100% realistic detail. Some models even come with the exact size and weight of a real buck! Whether you’re preparing for an upcoming archery shooting competition or the next hunting season, a 3d deer target never disappoints! Now, there are some special reasons why every serious bowhunter should start using the 3d archery targets to sharpen their aiming and shooting skills ahead of the next deer season. Most hunters have already discovered this game-changing practice target and are already using it to their advantage. 1. Starting with the most obvious one, a 3d target helps you improve your ability to fore clean kill shots. How? Well, the come with clearly illustrated design of where the vital organs- like heart, arteries, etc. - are located in a real-life deer. With every practice session, you’ll become better at precisely aiming at these points and, without a single doubt, you’ll have an easy time taking down your target deer in the woods when “that moment” comes. 2. Another important reason why you should start practicing with 3d targets is based on the fact they allow you to practice your shots from any angle or distance you wish. They come with a lightweight design, which means you can easily position and move them as you wish. From my personal experience hunting deer in the woods, I’d suggest that you try shooting in the most awkward angles you can think of. This way, you’ll never have to lose a deer when it shows up because you were in an awkward angle or position. 3. One more benefit of using the 3d target…Unlike the standard box models, these targets imitate the appearance, size, and weight of the real life deer. And that means you’ll be having a life like deer shooting experience whenever you practice with them. Isn’t this a cool way to boost your confidence?This would be even more helpful to beginner hunters who had never been in the woods before. They’ll have some firsthand experience on how it feels and looks like to take shots at a deer, and this will fully prepare them for the real hunting game. Heck, you can even take your target into the woods for an even more thrilling, 100% life like shooting practice- and you can do it from a treestand or a ground blind! Absolutely yes! Let me admit that I also had my doubts when I first came across this suggestion, not being sure if it’d work out. 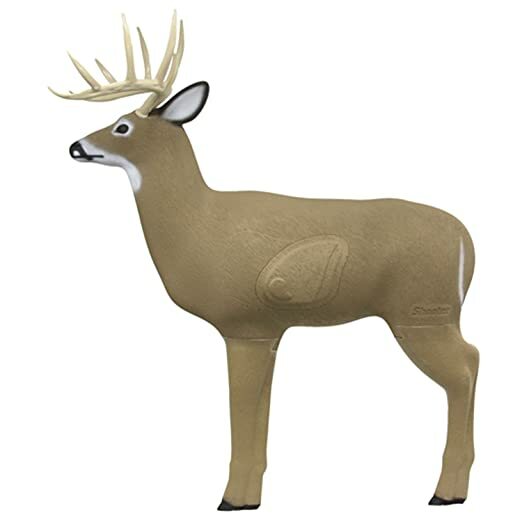 Then I figured out that a deer target looks just like a deer decoy…And both look like the real-life deer, so why won’t you use both of them to fool a deer into your shooting range? 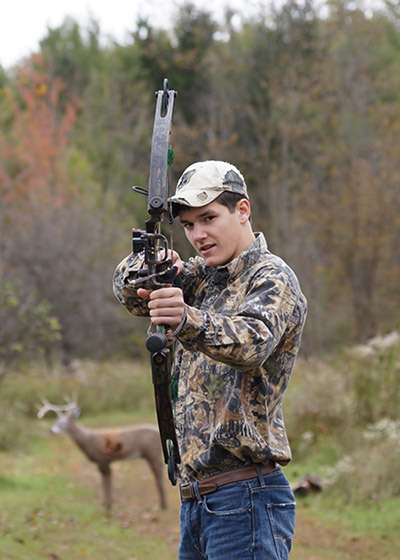 Another perfect example below shows a young male deer being intimidated by a 3d archery target. 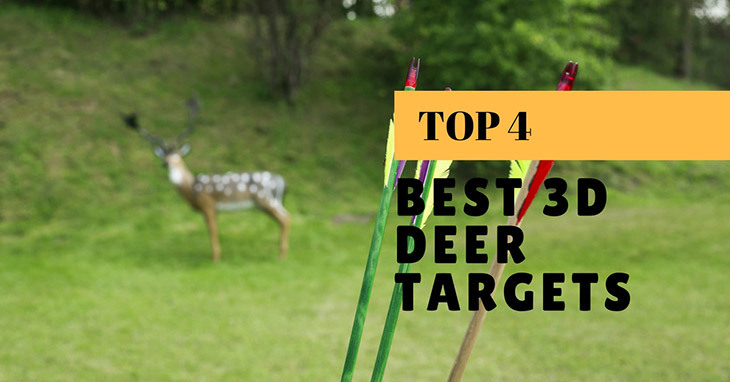 That’s it for our four best 3d deer targets for all bowhunters who want shoot up their shooting and aiming skills before the next hunting season kicks in. Judging from all the four reviews, it’s no doubt that the Shooter Buck Archery Target takes center stage when it comes to satisfying all your needs and requirements. Among the features you’ll love in this model include the use of Polyfusion technology for an overall uniform appearance and easy plucking of arrows, replaceable insert for extended lifespan, lifelike design, and its unwavering durability and toughness in the face of broadhead and field tip arrows. Amazingly, the target offers you all these premium features at a reasonable pricing!